Howard has always been a keen advocate for and involved in music education. As well as composing musicals, choral works and other repertoire for schools, colleges and other groups of young performers he was regularly seen acting as a compère or judge for young musician’s competitions. He was also on the board of Youth Music – the lottery distributor providing opportunities for the hardest to reach children and young people to access quality musical activities – for many years. 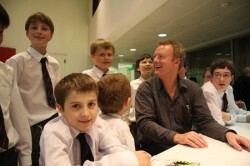 In 2005 Howard became involved with the Music Manifesto – a campaign for young people’s music. An early speech stressed how he was convinced that ‘there is the potential out there for our music in schools to be outstanding’. 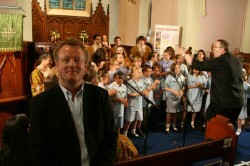 In 2006 he was asked to chair a research group to look at singing which became part of the Music Manifesto’s 2nd report – Making Every Child’s Music Matters – which was published in October 2006 (with an article by Howard within it). In January 2007 – at the Music Manifesto State of Play event – Howard was appointed National Singing Ambassador by the then Secretary of State for Education, Rt Hon Alan Johnson MP. The appointment was made alongside an announcement that a year of funding from the Department for Education for singing would become available from April 2007. This ring-fenced money (£10m in that first year, but increased (in November 2007) to £40m over four years) was to run a national singing programme to make every primary school a singing school. In February 2007 Howard wrote a message to Music Manifesto signatories in the wake of his appointment which can be read here. Following a tendering process by government a consortium lead by Youth Music (working in partnership with Faber Music, AMV BDDO and The Sage Gateshead) was appointed to run the programme which they gave the name Sing Up. As National Singing Ambassador, Howard worked with the Sing Up team to raise the profile of the programme and to encourage participation. By the end of the four years of his involvement over 90% of all primary schools in England had signed up to take part, hundreds of schools had achieved Sing Up Awards and thousands of custom essays uk teachers and other adults and young people had received training. Sing Up continued for an additional year with funding from the Department for Education (a further £4m) and since April 2012 has been set up as a limited company continuing to promote the value of singing in schools and beyond, providing resources and training. The service is now funded through subscriptions paid by schools and music leaders to access the provision which still includes a termly magazine and access to over 400 songs and other materials on the Sing Up website. Since completing his role as Ambassador Howard has continued to be a strong supporter of young people’s music making as well as working to educate the wider population through his broadcasting work.